The tour starts in Guiyang on Sunday. 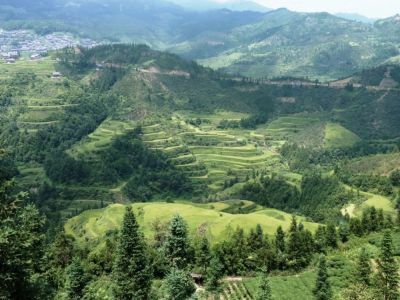 You will need to arrange multi destination flights to arrive in Guiyang Airport (KWE). This is not an international airport so you will fly into Guiyang from one of China's major airports. Your journey home is from Guilin (KWL). 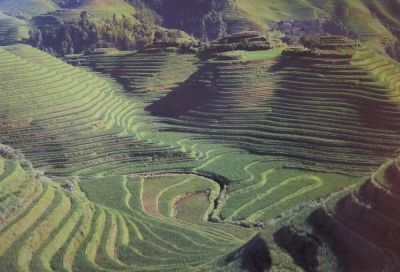 You can book internal flights to Guiyang via the following website http://english.ctrip.com/. It is in English and a trusted site. You can make payment using credit card. You must be in possession of a valid passport. All tourists visiting China require a valid China visa which needs to be applied for prior to travel. Please contact your local consulate or embassy for more information. Visa application forms for UK residents can be obtained by clicking here. 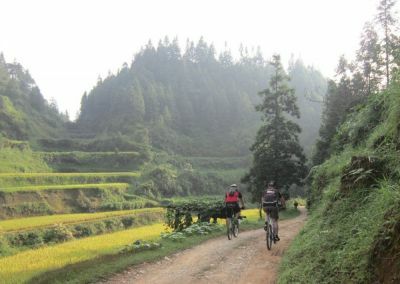 Our South East China tour is only suitable for mountain bikes. We have Giant ATX 790 ultra light mountain bikesavailable for hire with slick tyres, shimmano components and lock out front suspension. New models will be avalible from October 2018. 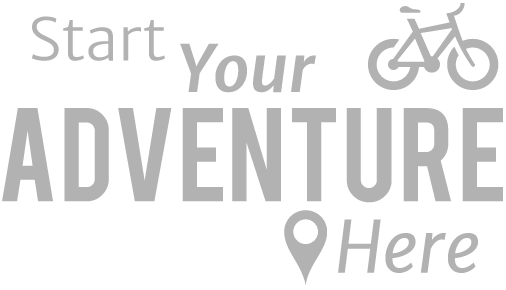 If you're not hiring from us you need to ensure that your bike is in good working order before you join the tour. If you are not the most mechanically minded we suggest that you get your bike serviced by a professional bike mechanic. In particular we would suggest looking and adjusting all wheel spokes, greasing all your bearings, checking your brakes/gears cable, tighten all nuts and bolts, check chain, quick release clamps, tires and put in new inner tubes and check wheel rims are not worn. In addition, ride with as much care and attention as possible. We would also advise you to bring the following tools: multi-tool, tyre levers, pump, 2 spare inner tube, spare spokes of the correct length to fit your wheels - check with a bike shop, brake pads, a few spare links for your chain, spares for any unique or high-tech items on your bike, e.g. fluid and bleed kit for hydraulic brakes. Your bike must be carried as a part of your luggage allowance; to this end we do advise you to make every effort to keep your total check-in baggage to an absolute minimum. The baggage allowance for most airlines for an economy-class ticket is 20kg per person; although a degree of flexibility is usually extended to groups and the check in staff may accept up to 26kg per person without imposing excess baggage charges. In terms of clothing this is clearly up to you and we can only supply a rough guide as to what to take. This guide is entirely flexible and should be tailored to your specific needs. Sunglasses, lightweight trekking boots/shoes, cycling footwear, lightweight socks (3 pairs), underwear (4 pairs), lightweight long johns, lightweight, long-sleeved shirt, lightweight trekking shorts, padded cycling shorts (2 pairs), shorts, t-shirts (2), long-sleeved shirt, fleece jacket/pullover, biking jacket waterproof (breathable fabric), fingerless biking gloves, sunglasses, toiletries, basic first aid kit (including: antiseptic cream, throat lozenges, painkillers, plasters, blister treatment and re-hydration salts (Dioralite), lip balm, sun cream, towel (small). If you have any questions about this list, please feel free to contact us. If you are bringing your own bike you must bring any spare parts specific to it. A detailed equipment list of what to bring with you will be provided on booking. Dark glasses, small day pack or pannier (assuming you have a rack to attach it to) to carry clothing, camera and valuables, a couple of spare passport photos, photocopies of key documents e.g. passport (data and visa pages), travel insurance policy, airline tickets, camera, photos of your family and postcards of your town to show the locals. There is one night when the support vehicle cannot travel the final 1km to reach our accommodation and you will need to carry your belongings for that night. We recommend you bring a small bag and just take what you need for the night. We can arrange storage for the rest of your luggage. Alternatively, you can pay to have a porter to carry your luggage. Your hand luggage is not included as a part of your overall allowance, as it is not weighed. Please inform your airline that you will be taking your bike on the flight, and attempt to make every effort to secure from the airline an additional baggage allowance - but this is not always granted. We cannot guarantee that there will not be excess baggage charges. 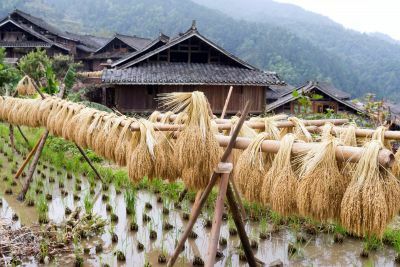 Most food is provided on tour, except in Guiyang, Zhaoxing, Ping An, Guilin and Yangshou, where you will need to pay for your lunch/evening meal. 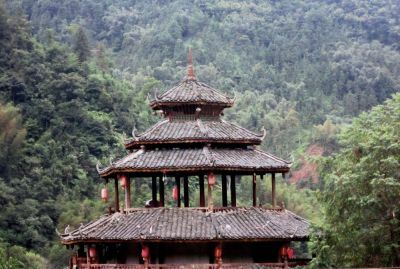 All transportation and local guides within China are provided. 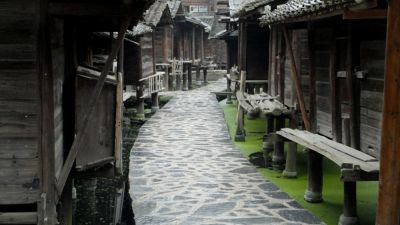 When you arrive in Guiyang (on the first day of the tour) you will be met and transferred to our hotel. Our holiday price does not include your international flight to China internal flights or your visa. Spending money depends on your taste for souvenirs, drinks etc. We estimate that £200/£275 will be more than enough to cover the 14/18-day tour. Tipping is an accepted part of everyday life, and although it is always at your discretion, you will be expected to tip to reward service. £25 for the guide and team at the end of the tour is recommended. Religion Buddhist (~18%), Daoist (Taoist), Christian 3%-4%, Muslim 1%-2%, Atheist 15%, most Chinese are religious pluralists. "Another really enjoyable redspokes trip. It was great to get to such out-of-the-way places, well off the tourist routes and get a unique experience of China. The contrast between the..."